What do people born in 1983, 1995, 2007 and 2019 have in common? They‘re all born in the year of the pig which is the 12th and the last animal of the Chinese zodiac cycle. In Chinese tradition, zodiac signs are all named after animals such as rat, goat or tiger. Rather than changing monthly, they are linked to a whole year. So there it is, 2019, the year of the pig. Surely, there is no shortage of pig associations in the western tradition. Often enough people are accused of eating like a pig, being fat like a pig or sweating like a pig. While these comparisons rather seem to refer to negative characteristics, in Chinese culture pigs have a different, more favourable, meaning. There, a fat pig is understood as being wealthy or fortunate – or so his chubby face suggests. A lifestyle of abundance, but earned through discipline and hard work. Also, they are known to show gentleness, enthusiasm, and vivacity. Now, for the mighty transition of the old dog to the young pig, from 2018 to 2019, Dublin has prepared a two-week long festival celebrating the Chinese New Year. From the 1st of February up until the 17th the city will become a huge playground showcasing Chinese traditions revolving around the year of the pig. With a bursting calendar of 80 events, several city sites offer everything from lectures, workshops, arts to concerts and food extravaganzas. Everybody is welcome to enjoy a new years celebration Chinese style, a feast for young and old, for Asian descendants, the Irish-born or people from any other part of the world. And that is exactly what can be expected of the celebration, a merger if you want, a connection of two cultures. To the owner of the Vintage Teapot, Angie Wang, the Dublin Chinese New Year Festival is the Asian version of Christmas. Born in China she migrated to Ireland 20 years ago and is now strongly rooted in the Chinese community in Dublin. Now, as part of the festival celebrations, she hosts workshops in her tea room on Cathedral Street – all of which are sold out. Whether it is the classical Chinese tea ceremony, doing flower arrangements or everybody’s darling – the traditional dumplings Chinese families have for New Years – the interest is immense. “Everybody knows that Chinese people love dumplings. 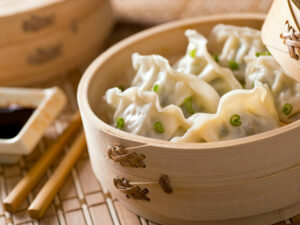 The dumplings are always the most popular and I find that people very very love them.”, Angie says. To her, the popularity of the workshops doesn’t come as a surprise. Celebrating the Chinese New Year is a must for the businesswoman, even though, or especially because, she is living so far away from home. “You need a lot of formalities. Otherwise, you will find that your life is lonely. We do need to celebrate because otherwise, every day is the same. All of the Chinese Community in Dublin celebrates.” It is that feeling of home that the Chinese New Year Festival in Dublin is prepared to deliver. Or as Aimée van Wylick puts it: “It is like having something from home away from home.” One thing is for sure. The Festival promises to be fun for everybody, child or adult, Asian or not. 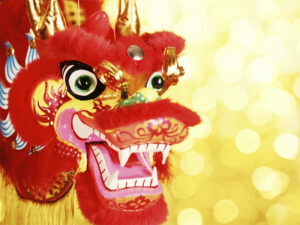 So be sure to check out the Festival programme and enjoy two weeks of Chinese culture.